Place grated burdock and potato in a clean dish towel (linen or cotton works best) and wring out excess moisture. This will help the patty stick together as it bakes. Add drained burdock and potato shreds to a bowl and then mix in garlic, flour, and salt until all the shreds are coated in a fine layer of flour. Add egg and stir until a sticky “dough” is formed. Place golf ball sized clumps of the mixture onto a greased parchment lined baking tray and flatten into a small patty shape. In a 350 F oven, bake patties for 25 minutes on one side, then flipping and baking 10-15 minutes on the other side. Patties should be crispy on the outside and golden brown. 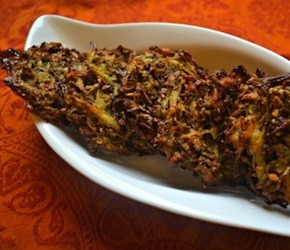 Can be served with a spicy dipping sauce, chutney, or delicious on their own.